Background: Long duration of treatment, side-effects of currently used anti-tubercular drugs and emergence of drug-resistant forms of Mycobacterium tuberculosis (MTB) warrants the need to develop new drugs to tackle the scourge of tuberculosis (TB). Garlic is an edible plant reported to have anti-tubercular activity. However, previous researches on anti-tubercular effect of garlic were focused mostly on preliminary in vitro screening. Objective: To identify constituents responsible for anti-tubercular activity of thiosulfinate-derivative rich extract of garlic (GE) and to evaluate activity of the most active constituent in RAW 264.7 mouse macrophage cells infected with M. tuberculosis H37Rv (MTBH). Materials and Methods: In the present study, we have isolated eight compounds from GE by flash chromatography. The isolated compounds were characterized by 1H nuclear magnetic resonance spectroscopy, liquid chromatography-mass spectrometry and Fourier transform infrared spectroscopy. Individual isolates and GE were screened for activity against MTBH by Resazurin Microtitre Plate Assay (REMA). Results: Anti-tubercular activity of GE was superior to that of isolates when evaluated by REMA, possibly due to synergism amongst the constituents of GE. Cytotoxicity of GE was evaluated in RAW 264.7 mouse macrophage cells and it was observed that GE had a favorable selectivity index (>10). Therefore, anti-tubercular activity of GE was further evaluated by intracellular macrophage infection model. GE demonstrated concentration-dependent activity in macrophages infected with MTBH. Conclusion: This is the first report on intracellular anti-tubercular activity of any extract of garlic or its components. Appreciable intracellular anti-tubercular activity of GE in macrophages combined with low cytotoxicity makes it a suitable candidate for further development as an anti-tubercular agent. Abbreviations used: TB: Tuberculosis, MTB: Mycobacterium tuberculosis, MTBH: Mycobacterium tuberculosis H37Rv, GE: Thiosulfinate-derivative rich extract of garlic, REMA: Resazurin Microtitre Plate Assay, VD: Vinyldithiin, CFU: Colony forming unit, 1H NMR: 1H nuclear magnetic resonance spectroscopy, FT-IR: Fourier transform-infrared spectroscopy, LC-MS: Liquid chromatography-mass spectrometry, IC50: Concentration required to inhibit the cells by 50%, ANOVA: Analysis of variance. Extract showed appreciable activity in RAW 264.7 mouse macrophage cells infected with MTBH, indicating its potential to be developed further as an anti-tubercular agent that can be administered as an adjunct to the existing anti-tubercular drug regimen. Tuberculosis (TB), along with HIV is the leading cause of morbidity and mortality worldwide. In 2014, World Health Organization reported 9.6 million new TB cases, out of which approximately 480,000 were affected by multi-drug resistant (MDR) forms of Mycobacterium tuberculosis (MTB). The largest numbers of TB cases in 2014 were reported in India (23%), Indonesia (10%) and China (10%). In spite of being a major health problem, TB has remained a neglected disease. Since the introduction of rifampicin as an anti-tubercular agent, drug discovery for treatment of TB has been sluggish. Currently, the cornerstone of TB control is the prompt treatment using first-line drugs-isoniazid, ethambutol, rifampicin, pyrazinamide and streptomycin, administered through the directly observed treatment short-course (DOTS) strategy. There are several drawbacks associated with the currently used DOTS course, like long duration and complexity of treatment, which leads to patient non-compliance. In addition, various side effects, like hepatotoxicity and nephrotoxicity, associated with the currently used anti-tubercular drug regimen leads to untimely and often premature cessation of the treatment. Furthermore, emergence of MDR, extensively-drug resistant and totally-drug resistant strains of MTB has proved to be a serious threat to TB control and eradication. This situation highlights the urgent need to identify new drugs that will help in reduction of the treatment period and are effective against all forms of MTB with fewer side-effects. The anti-tubercular activity of garlic was first reported in 1946. Since then, various studies have been carried out to determine the preliminary in vitro anti-tubercular activity of garlic.,,,, The activity of crude aqueous/ethanolic garlic extract against drug-resistant forms of MTB has also been investigated., Moreover, hepatoprotective activity of garlic extract against anti-TB drug induced hepatotoxicity is proven., These properties of garlic make it a suitable candidate for further exploration of its anti-tubercular potential. Most of the research carried out pertaining to the anti-tubercular activity of garlic has been done using isolated allicin or aqueous garlic extract rich in allicin and other thiosulfinates. 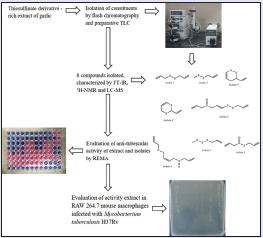 The present study was carried out to determine anti-tubercular activity of thiosulfinate-derivative rich extract of garlic (GE) and to identify components of the extract responsible for the activity. The extract was further evaluated for its anti-tubercular potential in RAW 264.7 mouse macrophage cells infected with Mycobacterium tuberculosis H37Rv (MTBH). In human beings, MTB grows and multiplies within the macrophages and therefore it is important to evaluate the activity of a potential anti-tubercular agent within macrophages infected with MTB. To the best of our knowledge, this is the first report on anti-tubercular activity testing of any extract or constituent of garlic in macrophages infected with MTB. All the chemicals and solvents used in this study were of analytical reagent grade and were purchased from SD Fine, India. Middlebrook 7H9 broth base and Middlebrook 7H11 agar base were purchased from Difco Laboratories. Antibiotic-antimycotic solution, RPMI-1640 media and fetal bovine serum were procured from GIBCO, Life Technologies Corporation, USA. ADC and OADC growth supplements were procured from Hi-Media Laboratories Ltd., India. Standard drugs isoniazid, ethambutol and rifampicin were obtained as gift samples from Lupin Ltd., Mumbai, India. Garlic bulbs were procured from the local market in Mumbai, Maharashtra, India. The plant was authenticated and a voucher specimen of the same (#:ppP1030620) was deposited in the Herbarium of Department of Botany, G.N. Khalsa College, Mumbai, India. To obtain GE, fresh garlic bulbs (150 g) were crushed and refluxed using hydroalcoholic mixture (1:1, 500 mL) for 2 h at 40°C. Ethanol was recovered under vacuum at 30°C. The marc that was obtained was filtered using a muslin cloth and the filtrate was subjected to solvent partitioning using ethyl acetate. The ethyl acetate layer was concentrated under vacuum at 30°C to obtain a yellowish-brown oily extract. This extract (GE) was stored at −20°C until further use. GE was analyzed by High Performance Thin Layer Chromatography (HPTLC). Samples (20 μL) were applied as bands on aluminum coated TLC silica gel 60 F-254 plates (Merck, Germany) using Camag Linomat 5 applicator. The plates were developed using a mobile phase consisting of toluene: ethyl acetate: chloroform: methanol (8:20:12:60% v/v). The plates were then scanned at 254 nm using Camag TLC scanner 3. GE was further chromatographed using Buchi C615 flash chromatography system (Buchi Sepacore Record 1.0 software). Fractions were eluted using a gradient of chloroform: methanol (100:0–90:10). The fractions that were obtained were further purified by preparative TLC using silica gel GF254 as the stationary phase and toluene: ethyl acetate: chloroform: methanol (8:20:12:60% v/v) as the mobile phase. The compounds which were isolated were characterized by Liquid Chromatography-Mass Spectrometry (LC-MS) by electro spray positive ionization technique using WATERS, Micromass Q-TOF with Waters Alliance 2795 micro separation module (Waters X-Terra C-18 column); Fourier Transform-Infrared spectroscopy (FT-IR) (JASCO FT/IR-4100 type A instrument) and 1H-Nuclear Magnetic Resonance (1H-NMR) (Bruker Advance II 400 NMR spectrometer with 1.3 Topsin software using deuterated chloroform as solvent). MTBH (ATCC 27294) was grown at 37°C in Middlebrook 7H9 broth medium supplemented with 10% ADC (albumin dextrose-catalase) supplement. Culture of MTBH in log-phase of growth was centrifuged for 10 min at 2500 rpm, washed twice and suspended in phosphate-buffered saline. The cultures were thoroughly cyclomixed in a glass tube containing glass beads and passed through 21-gauge needle to obtain a single cell suspension. Optical density of the culture suspension was measured at 600 nm and it was suitably diluted using Middlebrook 7H9 broth before being used for the studies. The anti-tubercular activities of GE and isolates were first evaluated by Resazurin Microtitre Plate Assay (REMA) method as described by Martin et al., 2005, with minor modifications. Stock solutions (1000 μg/mL) of GE and isolates were prepared in 3% dimethyl sulfoxide (DMSO). Anti-tubercular activities of GE/isolates were compared with the activities of standard anti-tubercular drugs-rifampicin, isoniazid and ethambutol. 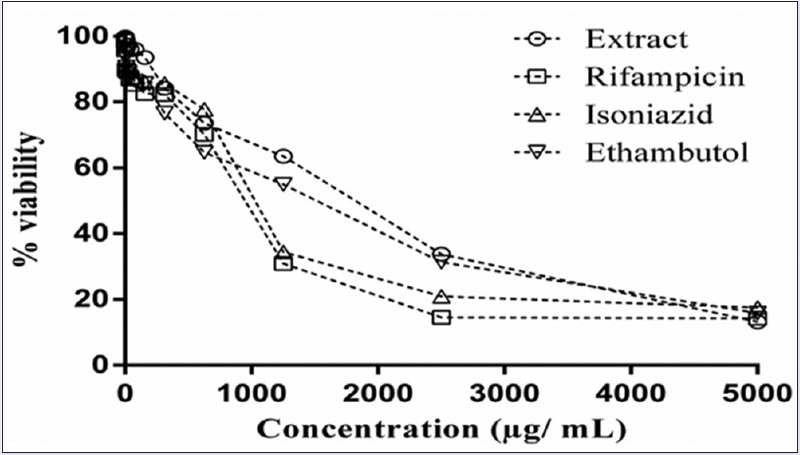 Stock solution of rifampicin (10 μg/mL) was prepared using 1% methanol. Stock solutions of isoniazid (200 μg/mL) and ethambutol (200 μg/mL) were prepared using sterile water. The stock solutions were filtered using sterile 0.22 μm nylon filter (Hi-Media Laboratories, India). Further dilutions were made aseptically using Middlebrook 7H9 broth. 100 μL sterile Middlebrook 7H9 broth was aseptically dispensed into each well of the 96-well microtitre plate (Tarsons). 100 μL of stock solutions of GE/isolates and standard drugs were dispensed in triplicate into the microtitre plate and sequential 2-fold dilutions were made in the plate itself. This was followed by addition of 100 μL of MTBH culture suspension containing 2 × 106 colony forming unit (CFU) in 1 mL of broth. Sterility controls, growth controls and DMSO/methanol containing growth controls were also maintained. Plates were incubated at 37°C for 7 days under humidified conditions. After completion of incubation period, 30 μL of 0.01% w/v sterile resazurin sodium solution was added and the plates were again incubated at 37°C for 24 h. The plates were then observed for color change from blue to pink/colorless, which indicated growth. The lowest extract/drug concentration that prevented color change from blue to pink was taken as the upper limit for minimum inhibitory concentration (MIC) range, whereas, the highest drug concentration that showed change in color from blue to pink was considered the lower limit. The extract/isolate that showed appreciable anti-tubercular activity by REMA method was considered for evaluation of anti-tubercular activity in RAW 264.7 mouse macrophages infected with MTBH. RAW 264.7 mouse macrophage cells were routinely maintained as described by Chandrasekaran et al., with minor modifications. Briefly, RAW 264.7 mouse macrophage cells were maintained in a 25 cm 2 cell-culture flask (Tarsons) using RPMI-1640 medium supplemented with 10% fetal bovine serum, 1% antibiotic-antimycotic solution, 2.0 g/L sodium bicarbonate, 1% L-glutamine and 25 mM HEPES buffer, at 37°C in a humidified incubator with 5% CO2 supply. After reaching 90% confluence, the cells were trypsinized, counted by trypan blue dye exclusion technique using a hemocytometer and used for further studies. The in vitro cytotoxicity of GE and standard drugs were evaluated in RAW 264.7 mouse macrophage cell lines by 3-(4,5-dimethylthiazol-2-yl)-2,5-diphenyltetrazolium bromide (MTT) assay. Stock solution of GE (10,000 μg/mL) was prepared in 3% DMSO and further dilutions were made with complete RPMI medium to obtain concentrations ranging from 2.5 to 5000 μg/mL. Stock solution of rifampicin (10,000 μg/mL) was prepared in 1% methanol, whereas, stock solutions of isoniazid (10,000 μg/mL) and ethambutol (10,000 μg/mL) were prepared in complete RPMI medium. The standard drugs were further diluted using complete RPMI medium to obtain concentrations ranging from 2.5 to 5000 μg/mL. For evaluation of cytotoxicity, 104 cells/well (in 100 μL complete RPMI medium) were seeded in 96-well microtitre plates. The plates were incubated at 37°C, 5% CO2 for 24 h to allow adhesion of cells to the base of the microtitre plate. The supernatant from each well was then discarded and 100 μL of various concentrations of GE and standard drugs were added in triplicate to the wells. The plates were again incubated at 37°C, 5% CO2 for 4 days. After completion of the incubation period, the supernatant was discarded and cells were washed with 1 × phosphate buffered saline (PBS) before addition of 100 μL MTT (0.5 mg/mL). The plates were then incubated for 4 h at 37°C, 5% CO2. The metabolically active cells reduced MTT to a purple colored insoluble derivative called formazan. Formazan crystals that were formed were dissolved by adding 100 μL of 20% sodium dodecyl sulfate (SDS) to each well. The plates were then kept at room temperature for 30 min to allow complete solubilization of formazan and the absorbance readings were taken at 570 nm using a microplate reader. The percentage cell viability in presence of extracts/standard drugs was calculated in comparison to the untreated cells. The IC50 and selectivity index values were determined. IC50 was defined as the concentration of extract/standard drugs at which 50% cells were viable in comparison to the untreated control wells. Selectivity index was defined as the ratio of IC50 to MIC value obtained by REMA. In order to further validate the results obtained by REMA, the activity of GE was evaluated in RAW 264.7 mouse macrophage cells infected with MTBH. RAW 264.7 mouse macrophage cells were plated in 24-well tissue culture plates at a concentration of 106 cells per well in complete RPMI medium. The cells were then incubated at 37°C, 5% CO2 for 24 h. The supernatant from each well was then discarded and the cells were infected with 1 mL of bacterial suspension containing 5 × 106 CFU of MTBH in antibiotic-free RPMI medium. The plates were then incubated at 37°C, 5% CO2 for 4 h. The cells were washed four times with PBS to remove any traces of extracellular bacteria. 1 ml of varying concentrations of extract solution (5–150 μg/mL) prepared in antibiotic-free RPMI medium was added to the wells. Rifampicin, isoniazid and ethambutol (10 μg/mL) were used as positive controls. Negative control wells contained untreated cells infected with MTBH. The plates were incubated at 37°C, 5% CO2. On day 1 and day 4, the supernatant from each well was discarded and the cells were gently washed with antibiotic-free RPMI. The cells were then lysed using 0.06% SDS dissolved in sterile water. The lysates were diluted in 1:10 ratio with sterile PBS and 10 μL was plated on Middlebrook 7H11 agar (Difco) supplemented with OADC. The plates were incubated for 21 days at 37°C in a humidified incubator and the colony forming units were enumerated. Data was expressed as CFU × 104 ± standard deviation (SD) (n = 3) for each drug concentration. The concentration of extract required to reduce the initial bacterial concentration by 90% was calculated. All experiments were carried out in triplicate and results were expressed as mean ± SD. Statistical significance of data was evaluated by two-way Analysis of Variance (ANOVA) test using GraphPad Prism 6.0 software (GraphPad Software Inc., California). The data was considered to be statistically significant if P ≤ 0.05. Fresh garlic bulbs were extracted by the method described above and yield of GE obtained was 0.7 ± 0.2% w/w. The extract was qualitatively analyzed by HPTLC method. GE was further chromatographed using a flash chromatography system followed by preparative TLC to isolate individual components present in the extract. Eight different components were isolated from the extract. 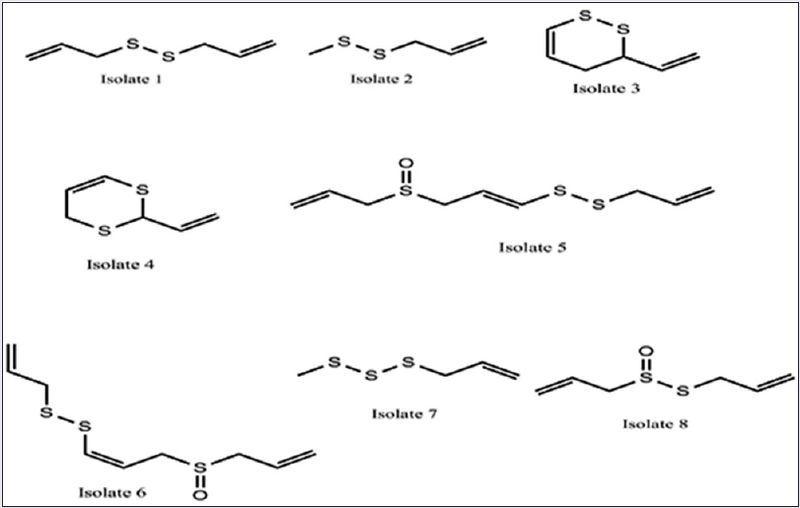 Characterization of each of the isolates was carried out by FT-IR, LC-MS and NMR. Structures of isolates 1–8 are presented in [Figure 1]. Isolate 1: Clear yellow liquid; mass (m/z): 147.09 [M+1]+; 1H-NMR (δ): 6.13 m (S-CH2-CH=CH2), 5.09 d (S-CH2-CH=CH2), 3.34 d (S-CH2-CH=CH2); FT-IR (cm -1): 3097 (C-H), 2991 (C = CH), 580 (S-S), 1642 (C = C). These data were consistent with the structure of diallyl disulfide. Isolate 2: Clear faint yellow liquid; mass (m/z): 120.23 [M+1]+;1H-NMR (δ): 6.07 m (S-CH2-CH=CH2), 5.12 m (S-CH2-CH=CH2), 3.29 d (S-CH2-CH=CH2), 2.41 s (CH3-S-S); FT-IR (cm -1): 3082 (C-H), 2978 (C = CH), 569 (S-S), 1629 (C = C). These data were consistent with the structure of allyl methyl disulfide. Isolate 3: Reddish brown oil; mass (m/z): 144.25 [M +];1H-NMR (δ): 6.12 d (S-CH=CH), 5.99 m (CH-CH=CH), 5.74 m (CH=CH-CH2), 5.18 m (CH-CH=CH), 3.36 m (CH2-CH-CH), 2.28 m (CH-CH2-CH); FT-IR (cm -1): 567 (S-S, w), 3024 (C=C-H), 1630 (C = C). These data were consistent with the structure of 3-vinyl-4H-1,2-dithiin (3-VD). Isolate 4: Red oil; mass (m/z): 144.25 [M +];1H-NMR (δ): 6.18 d (CH=CH-S), 5.82 m (CH2-CH=CH), 5.19 d (CH=CH2), 4.58 d (S-CH-S), 3.26 d (CH-CH2-S); FT-IR (cm -1): 3018 (C=C-H), 1609 (C = C). This fraction was identified as 2-vinyl-4H-1,3-dithiin (2-VD). The isomers of VD viz., fraction 4 and 5 were differentiated on the basis of NMR data. Isolate 5: Yellow oil; mass (m/z): 235.1 [M+1]+;1H-NMR (δ): 6.23 d (CH=CH-S), 5.98 m (S-S-CH=CH-CH2), 5.74 m (CH2=CH-CH2), 5.46 m (CH2=CH), 5.09 m (CH2=CH), 3.21 d (=CH-CH2-S=O), 3.38 d (S-S-CH2-CH); FT-IR (cm -1): 1095 (S=O stretch), 1387 (S=O), 1645 (C=C), 3062 (C-H). The spectral characterization data of this fraction was consistent with the structure of E-ajoene. Isolate 6: yellow oil; mass (m/z): 235.1 [M+1]+;1H-NMR (δ): 6.13 d (CH=CH-S-S), 5.82 m (CH2-CH=CH2), 5.53 and 5.24 m (CH2=CH-CH2-SO), 3.5 m (CH-CH2-SO-CH2-CH), 3.23 d (S-S-CH2-CH); FT-IR (cm -1): 1097 (S=O stretch), 1658, 1642 (C = C), 3078 (C-H). This fraction was identified as Z-ajoene. Both fraction 6 and 7 showed a characteristic S=O stretch at 1097. The structures of ajoene isomers were identified based on the NMR data. Isolate 7: yellow oil; mass (m/z): 152.3 [M+1]+;1H-NMR (δ): 5.96 m (CH2-CH=CH2), 5.03 and 5.14 m (CH=CH2), 3.23 d (S-CH2-CH), 2.12 s (CH3-S); FT-IR (cm -1): 2857 (C-H stretch), 3094 (=C-H) bend, 658 (C-S stretch). The spectral data of isolate 7 was consistent with the structure of allyl methyl trisulfide. Isolate 8: yellow oil; mass (m/z): 162.27 [M +];1H-NMR (δ): 6.05 m (S-CH2-CH=CH), 5.92 m (CH2=CH-CH2), 5.52 d (1H), 5.41 and 5.12 d (CH2=CH-CH2-SO), 5.22 d (CH2=CH-CH2-S), 3.31 d (CH-CH2-SO-S); FT-IR (cm -1): 1085 (S=O), 2869 (C-H stretch), 3090 (=C-H) bend, 651 (C-S stretch). The spectral data of fraction 8 was consistent with the structure of allicin. GE was majorly composed of the isomers 3-VD and 2-VD followed by E/Z-ajoene. The sulfides were present in minor quantities in the extract. Though the extraction procedure involves the use of organic solvents, a small amount of allicin was retained in the extract, possibly due to the controlled heating and fractionation techniques used during the extraction procedure. The spectral data recorded for isolates 1, 3, 4, 5, and 6 are in agreement with the data previously reported by Ilic et al. in 2012 where they had studied the effects of various physical and chemical parameters on transformation of allicin. The anti-tubercular activity of GE was evaluated in vitro by REMA method. The extract showed appreciable activity against MTBH when evaluated by REMA. Therefore the individual compounds 1–8 isolated from GE were evaluated in an effort to identify the components responsible for anti-tubercular activity of GE. The anti-tubercular activity of GE, isolates, isoniazid, ethambutol and rifampicin are presented in [Table 1]. In 2001, Tsao and Yin reported that the number of disulfide bonds was an important factor in determining the antimicrobial potential of diallyl sulfide components present in garlic. This may be the probable reason why diallyl disulfide and allyl methyl disulfide did not show anti-tubercular activity at the highest concentration tested, i.e., 250 μg/mL, whereas, allyl methyl trisulfide was active at 125–250 μg/mL when evaluated by REMA. It has been reported in literature that Z-ajoene possesses better antimicrobial and antioxidant activity than E-ajoene., However, in our study we observed that E-ajoene showed anti-tubercular activity at 125–250 μg/mL and Z-ajoene was inactive at the highest concentration evaluated i.e., 250 μg/mL. This may be possibly due to degradation of Z-ajoene after incubation at 37°C for 7 days. Allicin, though present in minor amounts in the extract was found to be very effective against MTBH. Our findings are in agreement with the results previously reported for anti-tubercular evaluation of allicin. The anti-tubercular activity of allicin and ajoene may be due to the presence sulfinyl and disulfide groups, which are reported to be important for antimicrobial activity of sulfur-containing compounds., Both isomers of VD were found to be active against MTBH and 2-VD was more active than 3-VD. Though isolates 3, 4, 5, 7 and 8 were active against MTBH when evaluated by REMA, their activities were significantly lower than the anti-tubercular activity of GE. Moreover, GE showed significantly better activity than combination of compounds 3, 4, 5, 7 and 8 (P < 0.05). This implies that all compounds present in GE act in synergism to exert the anti-tubercular activity. The solvent control wells used in the study had turned pink, indicating that the solvents had no bearing on the anti-tubercular activity of GE or its isolates. When evaluated by REMA, it was observed that GE possessed appreciable anti-tubercular activity, however, rifampicin, isoniazid and ethambutol showed significantly better activity as compared to GE (P < 0.05). The compounds that show good anti-tubercular activity by in vitro techniques are screened using macrophage infection assay to determine its ability to inhibit growth of MTB in intracellular conditions. Since GE showed significantly better activity as compared to the isolates, GE was considered for evaluation of cytotoxicity and anti-tubercular activity in RAW 264.7 mouse macrophage cells. The cytotoxic effect of GE against RAW 264.7 mouse macrophage cells was evaluated by MTT assay. The results of the study are summarized in [Figure 2]. As evident from [Figure 2], GE showed least cytotoxic potential as compared to standard drugs at all concentrations tested. After 4 days of incubation, 50% reduction in viability was observed only in cells treated with approximately 1800 μg/mL GE. Rifampicin, isoniazid and ethambutol showed significantly greater cytotoxicity as compared to GE at all concentrations evaluated (P < 0.05). The IC50 value for rifampicin and isoniazid were approximately 1000 μg/mL and that for ethambutol was 1250 μg/mL. The selectivity index of the extract was calculated by dividing the IC50 by MIC. It was observed that the selectivity index for GE was 120. Compounds showing selectivity index >10 are considered to be suitable candidates for evaluation of intracellular anti-tubercular activity. Therefore, GE was considered suitable for further evaluation of anti-tubercular activity in RAW 264.7 macrophage cells infected with MTBH. Mycobacteria remain housed in the phagosomal compartment of the macrophages, therefore, it is necessary to either activate the macrophages or deliver drugs to target the macrophages in order to kill the intracellular mycobacteria. The anti-tubercular activity of GE within RAW 264.7 mouse macrophage cells was tested after incubation of infected macrophages with various concentrations of the extract (5–150 μg/mL) for 1 and 4 days. The activity of GE was compared to that of the standard drugs rifampicin, isoniazid and ethambutol. The concentration of standard drugs used in the study was 10 μg/mL, which is higher than the reported Cmax of the drugs after oral administration of the standard DOTS course.,, The number of CFUs were plotted against drug concentrations and the results are summarized in [Figure 3]. The maximum concentration of GE used in the study was 150 μg/mL, i.e., approximately 1/10th of the IC50 value obtained from cytotoxicity studies. This implies that approximately 95% cells were viable even after 4 days of treatment with the maximum concentration of GE used in the study. Therefore, the anti-tubercular activity of GE may be either due to its internalization or due to activation of the cells by its components. Statistical analysis of the results by two-way ANOVA revealed that GE showed significantly better anti-tubercular activity as the concentration was increased (P < 0.05). However, the difference between the activities of cells treated with same concentration of GE for different time intervals was not statistically significant for all concentrations, except 50 and 100 μg/mL (P > 0.05). Maximum activity of GE was observed at a concentration of 150 μg/mL after 4 days of incubation. As evident from [Figure 3]b, approximately one log reduction in the number of colony forming units (EC90) was observed after incubation of infected cells with 100 μg/mL for 4 days. It was observed that the standard drugs rifampicin (10 μg/mL), isoniazid (10 μg/mL) and ethambutol (10 μg/mL) also did not show one log reduction after 4 days of incubation with the infected macrophages. GE at 50 μg/mL showed intracellular anti-tubercular activity significantly better than ethambutol (10 μg/mL) and isoniazid (10 μg/mL) (P < 0.05). Rifampicin (10 μg/mL) showed better activity as compared to GE (50 μg/mL), however, the difference in activities was not statistically significant (P > 0.05). In the current study, we have explored the anti-tubercular potential of GE against MTBH. The extract showed significantly better anti-tubercular activity as compared to the isolates. The standard drugs, i.e., isoniazid, rifampicin and ethambutol showed significantly lower MICs as compared to GE by REMA method. However, when tested in RAW 264.7 mouse macrophages infected with MTBH, extract at 50 μg/mL showed activity comparable to rifampicin (10 μg/mL) and significantly better than isoniazid (10 μg/mL) and ethambutol (10 μg/mL). Cytotoxicity studies of the extract revealed that the IC50 value of GE in RAW 264.7 mouse macrophage cells was almost 1800 μg/mL as against the IC50 values of 1000 μg/mL for isoniazid and rifampicin and 1250 μg/mL for ethambutol. Standard drugs viz., rifampicin, isoniazid and ethambutol showed significantly higher cytotoxicity as compared to GE at all concentrations tested. It can thus be inferred that concentrations of GE that demonstrate anti-tubercular activity comparable to or better than the standard drugs in RAW 264.7 mouse macrophage cells have the added advantage of considerably lower cytotoxicity. In the human pathophysiology of TB infection, mycobacteria remain housed and grow within the macrophages. Therefore, it is of vital importance that a potential anti-tubercular agent is capable of exerting its effects within the milieu of macrophages. This is the first report on anti-tubercular activity of garlic extract or any compound isolated from garlic in macrophages infected with MTB. The results of the study demonstrate that garlic has the potential to be developed as an anti-tubercular agent that can be administered as an adjunct to the existing anti-tubercular therapy. This work was supported by Department of Atomic Energy-Board of Research in Nuclear Sciences (Project sanction no: 35/14/39/2014 - BRNS). The authors would like to thank Sophisticated Analytical Instrumentation Facility, Panjab University and M. K. Rangnekar Laboratory, Mumbai for the help provided in carrying out LC-MS/NMR and IR spectroscopy analysis respectively. The authors would like to acknowledge Lupin Laboratories, Mumbai for providing gift samples of rifampicin, isoniazid and ethambutol. The authors are thankful to National Institute for Research in Tuberculosis, Tamil Nadu, India for providing MTBH cultures. Department of Atomic Energy - BRNS (Project sanction no: 35/14/39/2014- BRNS). World Health Organization. Global Tuberculosis Report 2014. WHO/HTM/TB2014.08. Geneva: World Health Organization; 2014. Mohan A, Kumar DP, Harikrishna J. Newer anti-TB drugs and drug delivery systems. In: Muruganathan A, editor. Medicine Update. New Delhi: Jaypee Brothers Medical Publishers (for the Association of Physicians of India); 2013. p. 388-92.
van den Boogaard J, Kibiki GS, Kisanga ER, Boeree MJ, Aarnoutse RE. New drugs against tuberculosis: Problems, progress, and evaluation of agents in clinical development. Antimicrob Agents Chemother 2009;53:849-62. Negi AS, Kumar JK, Luqman S, Saikia D, Khanuja SP. Antitubercular potential of plants: A brief account of some important molecules. Med Res Rev 2010;30:603-45. Phadatare AG, Viswanathan V, Mukne A. Novel strategies for optimized delivery of select components of Allium sativum . Pharmacognosy Res 2014;6:334-40. Dini C, Fabbri A, Geraci A. The potential role of garlic (Allium sativum ) against the multi-drug resistant tuberculosis pandemic: A review. Ann Ist Super Sanita 2011;47:465-73. Benkeblia N, Lanzotti V. Allium thiosulfinates: Chemistry, biological properties and their potential utilization in food preservation. Food 2007;1:193-201. Fehri B, Ahmed MK, Aiache JM. The relaxant effect induced by Allium sativum L. bulb aqueous extract on rat isolated trachea. Pharmacogn Mag 2011;7:14-8. Rao RR, Rao SS, Natarajan S, Venkataraman PR. Inhibition of Mycobacterium tuberculosis by garlic extract. Nature 1946;157:441. Delaha EC, Garagusi VF. Inhibition of mycobacteria by garlic extract (Allium sativum ). Antimicrob Agents Chemother 1985;27:485-6. Naganawa R, Iwata N, Ishikawa K, Fukuda H, Fujino T, Suzuki A. Inhibition of microbial growth by ajoene, a sulfur-containing compound derived from garlic. Appl Environ Microbiol 1996;62:4238-42. Gupta RL, Jain S, Talwar V, Gupta HC, Murthy PS. Antitubercular activity of garlic (Allium sativum ) extract on combination with conventional antitubercular drugs in tubercular lymphadenitis. Indian J Clin Biochem 1999;14:12-8. Dibua UE, Odo GE, Udengwu S, Esimone CO. Cytotoxicity and antitubercular activity of Allium sativum and Lantana camara against mycobacterial isolates from people living with HIV/AIDS. Internet J Infect Dis 2010;8:1-10. Viswanathan V, Phadatare AG, Mukne A. Antimycobacterial and antibacterial activity of Allium sativum Bulbs. Indian J Pharm Sci 2014;76:256-61. Ratnakar P, Murthy PS. Purification and mechanism of action of antitubercular principle from garlic (Allium sativum ) active against isoniazid susceptible and resistant Mycobacterium tuberculosis H37Rv. Indian J Clin Biochem 1995;10:34-8. Hannan A, Ikram Ullah M, Usman M, Hussain S, Absar M, Javed K. Anti-mycobacterial activity of garlic (Allium sativum ) against multi-drug resistant and non-multi-drug resistant Mycobacterium tuberculosis . Pak J Pharm Sci 2011;24:81-5. Ilyas N, Sadiq M, Jehangir A. Hepatoprotective effect of garlic (Allium sativum ) and milk thistle (silymarin) in isoniazid induced hepatotoxicity in rats. Biomedica 2011;27:166-70. Nasiru A, Hafsat IG, Mohammad MM, Sabo AA. Hepatoprotective effect of garlic homogenate co-administered with anti-tuberculosis drugs in rat liver enzymes. Int J Biosci Biochem Bioinforma 2012;2:354. Yoshida S, Kasuga S, Hayashi N, Ushiroguchi T, Matsuura H, Nakagawa S. Antifungal activity of ajoene derived from garlic. Appl Environ Microbiol 1987;53:615-7. Villaflores OB, Macabeo AP, Gehle D, Krohn K, Franzblau SG, Aguinaldo AM. Phytoconstituents from Alpinia purpurata and their in vitro inhibitory activity against Mycobacterium tuberculosis . Pharmacogn Mag 2009;1:339-44. Martin A, Morcillo N, Lemus D, Montoro E, Telles MA, Simboli N, et al. Multicenter study of MTT and resazurin assays for testing susceptibility to first-line anti-tuberculosis drugs. Int J Tuberc Lung Dis 2005;9:901-6. Chandrasekaran CV, Sundarajan K, Edwin JR, Gururaja GM, Mundkinajeddu D, Agarwal A. Immune-stimulatory and anti-inflammatory activities of Curcuma longa extract and its polysaccharide fraction. Pharmacognosy Res 2013;5:71-9. Naik SK, Mohanty S, Padhi A, Pati R, Sonawane A. Evaluation of antibacterial and cytotoxic activity of Artemisia nilagirica and Murraya koenigii leaf extracts against mycobacteria and macrophages. BMC Complement Altern Med 2014;14:87. Orme I; Tuberculosis Drug Screening Program. Search for new drugs for treatment of tuberculosis. Antimicrob Agents Chemother 2001;45:1943-6. Skinner PS, Furney SK, Jacobs MR, Klopman G, Ellner JJ, Orme IM. A bone marrow-derived murine macrophage model for evaluating efficacy of antimycobacterial drugs under relevant physiological conditions. Antimicrob Agents Chemother 1994;38:2557-63. Ilic D, Nikolic V, Stankovic M, Nikolic L, Stanojevic L, Mladenovic-Ranisavljevic I, et al. Transformation of synthetic allicin: The influence of ultrasound, microwaves, different solvents and temperatures, and the products isolation. ScientificWorldJournal 2012;2012:561823. Tsao SM, Yin MC. In-vitro antimicrobial activity of four diallyl sulphides occurring naturally in garlic and Chinese leek oils. J Med Microbiol 2001;50:646-9. Naznin MT, Maeda T, Morita N. Antioxidant functions of E-and Z-ajoene derived from Japanese garlic. Int J Food Prop 2010;13:821-9. Yoo M, Kim S, Lee S, Shin D. Validated HPLC method and temperature stabilities for oil-soluble organosulfur compounds in garlic macerated oil. J Chromatogr Sci 2014;52:1165-72. Wilson AE, Bergaentzlé M, Bindler F, Marchioni E, Lintz A, Ennahar S.In vitro efficacies of various isothiocyanates from cruciferous vegetables as antimicrobial agents against foodborne pathogens and spoilage bacteria. Food Control 2013;30:318-24. Acocella G. Clinical pharmacokinetics of rifampicin. Clin Pharmacokinet 1978;3:108-27. Peloquin CA, Bulpitt AE, Jaresko GS, Jelliffe RW, Childs JM, Nix DE. Pharmacokinetics of ethambutol under fasting conditions, with food, and with antacids. Antimicrob Agents Chemother 1999;43:568-72. Peloquin CA, Namdar R, Dodge AA, Nix DE. Pharmacokinetics of isoniazid under fasting conditions, with food, and with antacids. Int J Tuberc Lung Dis 1999;3:703-10.